The Dueler H/T D684 II with UNI-T is a Bridgestone's Highway All-Season light truck tyre designed for light duty pickup sport utility vehicles driven primarily on the road. It was developed to provide aggressive looks and year-round traction, even in light snow. Bridgestone's Ultimate Network of Intelligent Tyre Technology (UNI-T) brings advanced tyre technologies together, taking tyre performance to a new level. This combination of innovative tyre design, roundness and tread compound maximizes the tyre's performance, ride quality and wear. 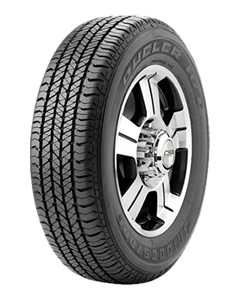 On the outside, the Dueler H/T D684 II features a symmetric independent block tread design. Its tread blocks and all-season tread compound were developed to provide traction on dry, wet and light snow-covered roads. Internally, the Dueler H/T D684 II features twin steel belts to stabilize the tread area and a polyester cord body to help cushion the ride.